Release Party attendees: Making the group photo. This photo credits: Julita Inca Chiroque. During this year’s Linux Autumn we organized Fedora 29 Release Party. These kind of events are organized around the world after the new version of Fedora is released. It’s likely that it was the world’s first Fedora 29 Release Party (for this version) because the official poster design was not yet ready and nobody had asked for it before. Again, being an organizer, I must warn you that my perception of the event may be different than the one of an attendee. But on the other hand I saw more behind the scene events. 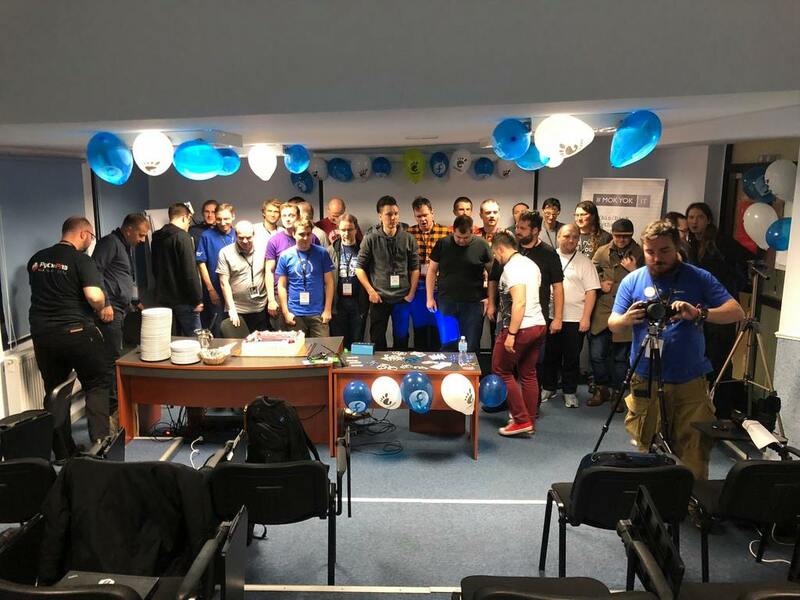 The party was attended by the Linux Autumn attendees. 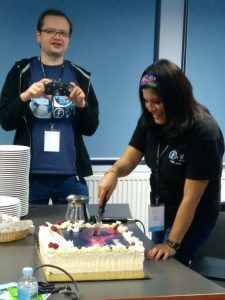 Its organizers included two Fedora ambassadors: Julita Inca Chiroque from Peru and Dominik “Rathann” Mierzejewski from Poland. 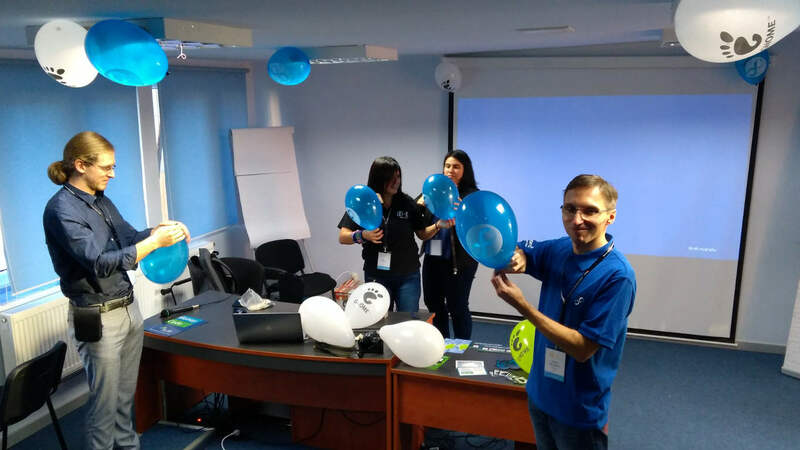 Julita, as always, brought lots of balloons with Fedora and GNOME logos, and Matej Marušák from Red Hat Brno brought Fedora stickers and other swag. Organizers of the Party. The author of this photo remains unknown for now. We allocated little time for this event, only 25 minutes. That’s short but initially we had thought it would be enough. For a longer while we had been discussing what should we do during the party. We did not have to tell the attendees what Fedora was because those people knew it well. It was worth to mention what’s new in this release compared to the previous ones but none of us was able to mention any new feature except modularity. 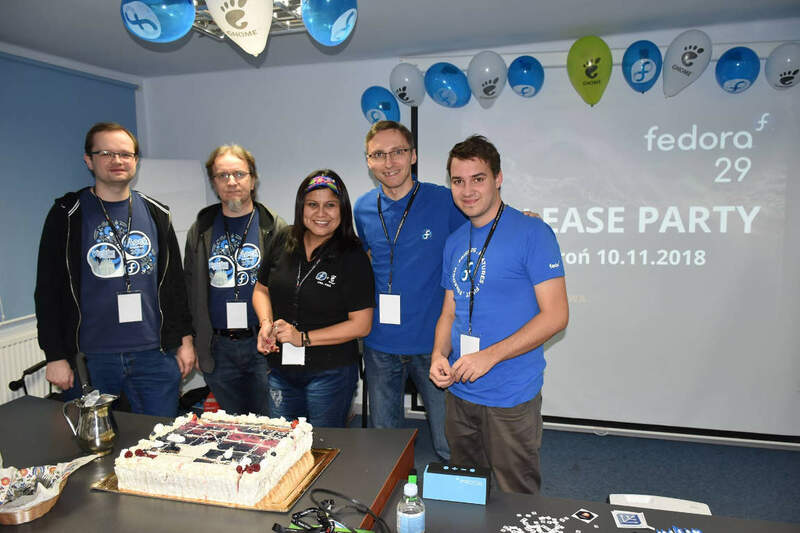 Of course, the core point of the event was the cake with Fedora logo. However, we did not want it to be the only point so we decided to talk about Fedora Accounts System: how to create an account and to become a contributor of Fedora. We also planned to talk about Fedora badges and mention that a badge will be awarded to the attendees of the Fedora Release Party. We decided that Julita would talk about it because she had been the most experienced of us all. But during the party Matej who had his laptop already connected to the projector and was near the microphone talked about everything and showed examples on the screen. He talked so perfectly that there was nothing more to add. 25 minutes turned out to be much too little. The following talks had to wait. But I think that nobody complained. 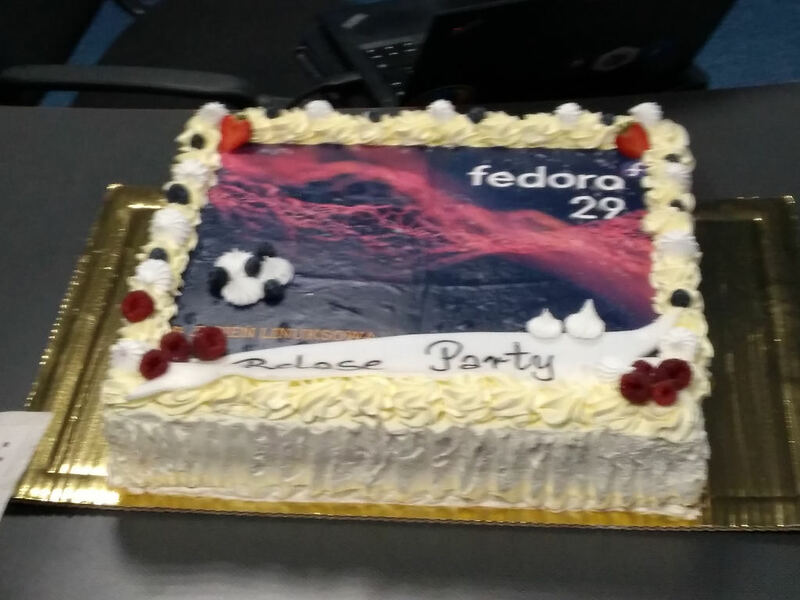 Even if one was not convinced to use Fedora (instead of other distros) then at least liked the cake.